With 10-year U.S. Treasury bills paying less than 2%, there's a lot to be said in favor of owning dividend stocks rather than bonds these days. The Dow Jones Industrial Average's (^DJI) surge to 13,000 (and beyond) means that fans of capital gains are also sitting pretty. And according to a recent poll of financial experts conducted by Barron's, dividend-paying stocks are the place to be, because they offer the best of both worlds -- a dividend payment today and a higher stock price tomorrow. 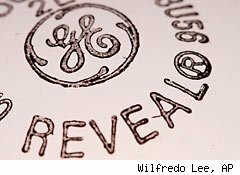 In the magazine's annual report on the "top 1,000 financial advisors," recommendations to buy shares of generous dividend payers such as General Electric (GE), Merck (MRK), and AT&T (T) featured prominently. As one member of Barron's illustrious 1,000 boasted: "Ninety-five percent of everything we buy pays us in some form of dividends or interest." And it seems investors are in no hurry to change that. Why not? A second analyst quoted in the article declared: "I believe we're in the beginning of the start of a long-term bull market." And a third: "It's time to back up the truck and load it up with stocks." But is all this exuberance rational? Amid all the enthusiasm, could it actually be time to dump your dividend stocks? Investing legend Warren Buffett has often warned investors to be "fearful when others are greedy, and greedy when others are fearful." Lately, greed has been paramount among dividend investors. 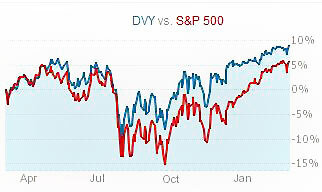 ...dividend-paying stocks suddenly gained favor last August, quickly leaving the rest of the market in the dust. Will this trend continue, though? There are at least a couple of reasons to worry that it won't. For one thing, long-term trends tend to "revert to the mean." This suggests that if dividend-paying stocks are performing strongly today, this could be a foreshadowing of their underperformance tomorrow. Indeed, the recent success of the sector had Barron's itself lamenting earlier this year that the yields on dividend payers had become "stingy." That's not surprising. With Treasuries paying near historic low yields lately, stocks haven't really had to pay much in the way of dividends in order to look generous by comparison. Indeed, the average yield on the S&P 500 today is a miserly 2%. But one reason for this apparent stinginess derives from how yields are calculated in the first place. You're Ruining It for Everyone Else! Consider the case of (imaginary) Pennsylvanian margarine-substitutes researcher Monongahela Original Oleo Laboratories Amalgamated (Ticker: MOOLA). The stock trades for $10 a share and pays a $1 annual dividend -- hence a 10% yield on its stock price. But what happens if investors suddenly decide that they like this generous yield, and flock to the stock? They bid up the price, and before you know it, Monongahela is selling for $20 a share (a 5% dividend), then $30 (3.3%), and maybe even $40 (2.5%). Pretty soon, Monongahela's dividend yield is looking as stingy as everyone else on the S&P -- and absent any improvement in earnings, its stock price is looking pretty overvalued as well. That could be what's happening to dividend stocks today. Compounding the risk that dividend stocks have become overpopular and overvalued is the potential for government action that could make these stocks very unpopular, virtually overnight. Currently, many dividends qualify for a reduced tax rate of 15%. But next year, if Congress doesn't take action, dividends will lose their preferential treatment and instead be treated as ordinary income. In Washington, President Barack Obama is said to be floating plans to allow that tax break to expire, in which case rates on dividend payouts could rise as high as the new top personal tax bracket of 39.6%. When you combine this new tax treatment with phased-out deductions and exemptions for high-income taxpayers, and add the 3.8% tax surcharge passed to help fund Obama's health-care law, experts say the effective rate on dividend income could soar as high as 44.8% -- or three times the current rate. Congress might restore the dividend tax break beyond the end of this year, of course. But with our national debt hitting new highs daily, Congress must find funds somewhere to finance its spending. And tweaking the formula for how dividends are treated is less likely to raise a ruckus among voters than actually raising tax rates. The time to dump your dividend stocks is before that happens. Afterward, it will already be too late. Motley Fool contributor Rich Smith does not own shares of any companies named above. Company profile: CA is one of the largest independent providers of IT management software. Revenue from its core mainframe segment represents about 60% of total sales. Investor takeaway: Shares jumped late in January after the company reported third-quarter earnings rose 32% and announced plans to raise its annual dividend five-fold to $1. Performance: up 27% (but still down 20% since the end of 2010). Company profile: Owens-Illinois is the world's largest manufacturer of glass bottles, with operations in 21 countries. 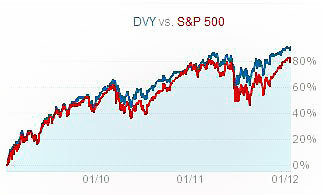 Investor takeaway: For 2011, the company earned $2.37 per share versus $2.60 in 2010. However, it also took a $640 million charge for a variety of reasons in the quarter that resulted in a loss of $4.71 per share on a GAAP accounting basis. It is covered by two analysts, resulting in ratings of one "buy" and one "hold." Company profile: Freeport-McMoRan's mines produce more copper and molybdenum than any other company in the world. It also produces gold. Investor takeaway: Metals mining have historically been highly volatile. Analysts give Freeport-McMoRan eight "buys" and one "hold," according to Morningstar. Two weeks ago, the company reported that fourth-quarter net profit was $640 million, down from $1.5 billion in same period of 2010, but full-year earnings hit a record $4.6 billion. Company profile: Bank of America is one of the largest financial institutions in the world, with lending operations in the consumer, small business, and corporate arenas as well as asset management and investment banking divisions. It just reported net income of $85 million, or 1 cent per share, for 2011, roughly in line with analysts' expectations. Investor takeaway: The bank faces lots of challenges before it returns to solid fiscal health, but investors apparently think they can be met, given the share-price rise. It was trading at half of book value late last year, so investors may think it hit bottom. Company profile: Eastman Chemical is a global producer of chemicals, plastics and fibers, with manufacturing sites in seven countries. Investor takeaway: During January, the company announced the $4.7 billion acquisition of Solutia (SOA), another chemicals and plastics-making firm, which may have contributed to the price pop. Although it has a diverse international customer base, some of its biggest customers are in the cyclical auto and construction industries. S&P has it rated "buy" and its $60 price target is a 20% premium to the current price. Company profile: LSI is a maker including of specialized circuits that support applications in enterprise storage and networking. Investor takeaway: Although it reported a fourth-quarter loss two weeks ago, LSI gave an upbeat outlook for the current quarter, saying it expects revenue in the range of $550 million to $590 million, far ahead of analysts' $511 million, according to data from FactSet Research. S&P's review of analysts' ratings found six "buys," two "buy/holds," five "holds" and one "weak hold." Company profile: First Solar manufactures solar modules and turnkey solar systems. It has a competitive advantage due to its technology. Investor takeaway: The company likely got a boost when, late in January, the MidAmerican Energy unit of Warren Buffett's Berkshire Hathaway (BRK.B) said it has started a new company to oversee a variety of solar, wind and other renewable-energy projects. In December, MidAmerican said it would buy a $2 billion California solar farm from First Solar, lending support to the outlook for the whole industry. Company profile: Sears Holdings is the parent to Sears, Sears Canada and Kmart stores and the fourth-largest retailer in the U.S.
Investor takeaway: This troubled stock rose on speculation that its primary shareholder, hedge fund manager Edward Lampert, may seek to take it private. Everything else seems to be going against Sears, including steadily declining earnings, but it does generate significant cash flow, which it has used to buy back shares and pay down debt. But a Morningstar analyst recently wrote that "we don't forecast much growth for Sears, but we do see the potential for a marginal improvement in operating results in 2013-2014 if the appliance market can rebound off current lows." Company profile: Textron's wide-ranging business interests span the aerospace, defense, financial and industrial markets. Its Cessna is the leader in business jets, while its Bell unit is a popular maker of helicopters. Investor takeaway: Textron is in many cyclical businesses and its defense sector is vulnerable to Congressional budget cutting. For 2012, its management is targeting an 11% improvement in sales, driven by further gains at Cessna and Bell, and $1.80 to $2 per share in earnings, about 35% to 50% higher than 2011's adjusted earnings. Since the end of 2010, its shares are up 8%. Performance: up 77% (but it's still down 29% from the end of 2010). Company profile: Netflix operates a fast-growing DVD rental and video streaming service and its customers are transitioning from DVDs to digital streaming content.